WATKINS GLEN, N.Y. -- In the autumn of 1974, 21-year-old Bobby Rahal got into his bright orange '72 BMW 2002tii and pointed it east toward Watkins Glen, N.Y. 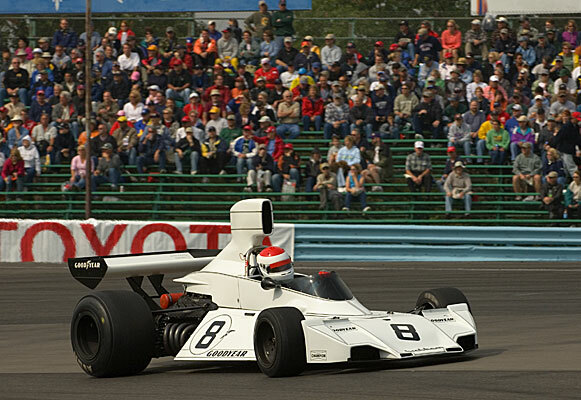 It turned out to be a memorable weekend for Rahal -- he won the first-ever Formula Atlantic race at The Glen and his resolve to drive in Formula One was strengthened after he watched Carlos Reutemann drive a Brabham BT44 to victory in the United States Grand Prix. Fast forward to fall, 2005. After watching his son Graham drive to a dominant Formula Atlantic victory in the SCCA National Runoffs at Mid- Ohio Sports Car Course on Friday, 52-year-old Bobby Rahal jumped into his freshly-restored BMW 2002tii -- the very same car that served as his street transportation more than 30 years ago -- and drove it to Watkins Glen. To complete the retro trip, Bobby then hopped into the very same Brabham that Reutemann used to win the '74 USGP and drove it to victory in the 10-lap Historic Grand Prix race run in support of the IndyCar Series' Argent Mortgage Indy Grand Prix. 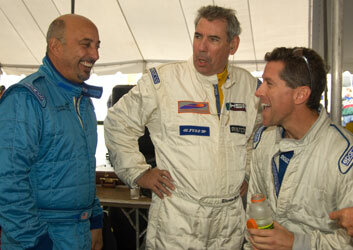 Bobby Rahal got to drive the car he could only dream of driving 31 years ago. Talk about a dream weekend. For Rahal, it helped avenge less-than- stellar memories of his own brief F1 career, which totaled just two races with Walter Wolf Racing in late 1978. He made his F1 debut at -- where else? Watkins Glen. 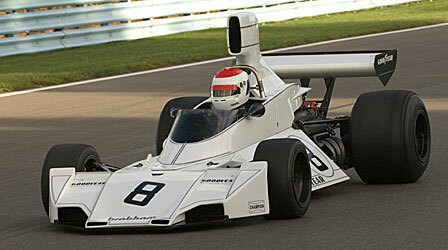 "This car is now 2-for-2 at this circuit and it was a dream come true for me to drive it," Rahal said of Gordon Murray's BT44 design, which won five F1 races in the hands of Reutemann and Carlos Pace in 1974-75. "When I was here in October of '74 when I won the Atlantic race I watched this car win and I dreamt of driving a car like this. If you're at all romantic about racing, which I am, it's so much fun to drive these cars and it's nice to appreciate what it was like in a really great era for Formula One." Rahal qualified on the front row and led from start to finish despite a strong challenge from Hamish Somerville in an ex-Alan Jones 1980 Williams FW07B. The only disappointing aspect of the HGP race for the fans who watched (including IndyCar driver Dario Franchitti, a keen student of racing history) was that Duncan Dayton completed only one lap in the JPS Lotus 79 that Mario Andretti drove to the 1978 F1 World Championship. "I talked to the guys in the driver's meeting and I told them I admired them because they are out racing these cars for people to see," Rahal commented. "They're not 'hangar queens.' The owners are very selfless about sharing their love for these cars with everybody here. Those cars are expensive to run, but you can tell by the reception from the fans that a lot of people are excited to see these cars run again. "So I expressed my appreciation to the owners for bringing these cars out and not just running them, but racing them hard. For anyone who loves the sport, it was a pleasure to see these cars driven in anger." And hear them. How a 3-liter Cosworth DFV V-8 can sound so good whereas a modern Cosworth Gen IV IndyCar engine can sound so bad is baffling. Eighteen of the 20 cars in the field were DFV-powered, accompanied by the distinctive wail of a solitary Ferrari flat-12 and a howling BRM V-12. "I was talking to the guy who runs the BRM and I remember when you knew what kind of car was coming without even looking," Rahal recalled. "They all had a distinctive sound and nowadays the cars all look and sound the same." After making the trip to The Glen in a '70s-vintage car and competing in a race car from the same era, Rahal was asked whether race cars or production cars have made a bigger advance in the ensuing decades. "That old '72 BMW is a nice little car," he replied. "I think they have both moved on in terms of technology, though not necessarily for the better." Just as cars move on, so do drivers. Now thirty years after Bobby claimed the 1975 SCCA National Championship in the Formula Atlantic division, Graham has done the same. The younger Rahal is likely to drive in Champ Car's upgraded pro Atlantic Championship next year, though political machinations are reportedly afoot to lower the minimum age to compete in the Menards Infiniti Pro Series from 18 so that 16-year old Graham can compete in an IndyCar-sanctioned series. "He's doing a great job and I don't think it will be too long before he's running around here in the big stuff," Rahal said. "I'm very proud of him."